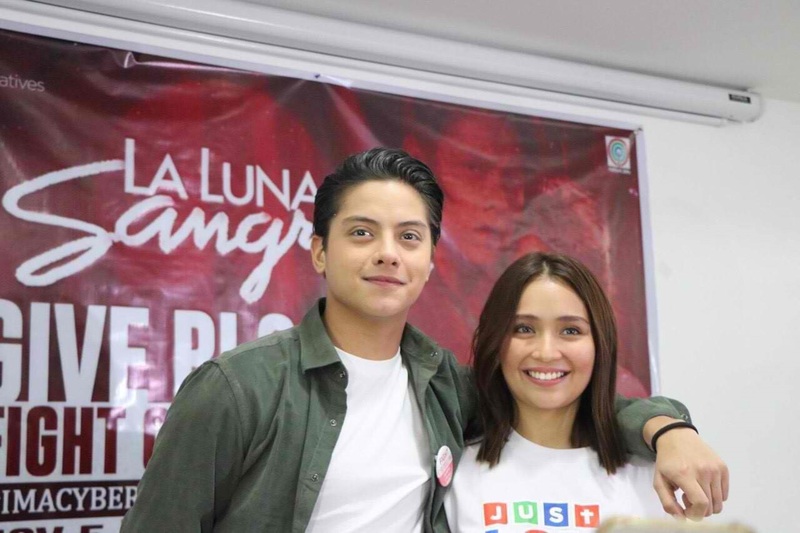 La Luna Sangre” stars Kathryn Bernardo and Daniel Padilla led the bloodletting event held at the Philippine Red Cross headquarters last Sunday (Nov 5), simultaneous with 23 other blood donation drives organized by Kathniel fans in different parts of the country. “Shortage of blood in the country is really a point of concern. We know some cases wherein it was hard for people to collect blood. I hope those who did not come today still donate blood in some other days so we can help our fellow Filipinos,” said Daniel. The event was able to generate 50,000 cc of blood. Aside from the bloodletting, Daniel and Kathryn also took the opportunity to shed light on their cyberbullying advocacy as CyberSmile ambassadors. The two reiterated their call to stop online bashing and for each and everyone to make a stand against cyberbullying. Kathryn and Daniel continue to topbill the hit primetime teleserye “La Luna Sangre,” which remains to be one of the most watched programs in the country. Last Friday (Nov 3), viewers were at the edge of their seats when Tristan’s heart stopped beating after Prof T. (Albert Martinez) gave him a virus to protect him from becoming a vampire. The different reaction of the virus in Tristan’s blood roused the curiosity of Prof T. and Samantha (Maricar Reyes) about his real identity. What is the mystery behind Tristan? How is Tristan connected to Sandrino?